I really enjoyed this novel – well-written as all Pauline Barclay’s books always are. The characters are well formed, especially Jane Leonard and Sally Bingley. As we are in the throes of moving house ourselves, it was particularly interesting and apposite! 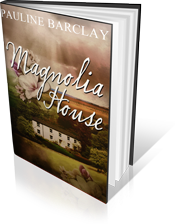 I would have liked to buy Magnolia House myself – in fact it seemed almost like a character in its own right. The backstories clearly revealed the author’s rich and rounded view of the protagonists in this tale of misunderstandings and anger when an older lady is forced to give up her beloved home which she had hoped to share with her son and his family. It shows the author’s perceptive grasp of the way in which we create our view of another person in terms of our emotional reaction to tragic events, rather than calmly discussing what has happened and reaching for the truth. But this is very true to life. It is a story of betrayal, love, family loyalty, redemption and forgiveness and as such is a positive and life-affirming tale. My only issues are with the ‘telling’ of backstories, past events and explanations and the tendency to head-hopping between characters. There is perhaps a little too much on the sub-plot(s) of other house-buyers and the estate agency and the coincidences of the ‘chain’ coming together. I think that this is a reflection of the fact that it is an early novel (a debut?). Still, very worthwhile and rewarding read. Loved it! There are more reviews to come from Julia, so please stop by again soon.